Mail4Rosey: Personal Creations KNOWS how to Celebrate National Coffee Day! Personal Creations KNOWS how to Celebrate National Coffee Day! It is no secret that I love coffee!! I like it hot, iced, black, with cream, and even sometimes with cream and just a bit of sugar. I like it flavored, unflavored, and if you want to put something in to make a fancy macchiato (or other specialty drink), I'm all in for that too! including a most excellent line of coffee mugs! I also like personalized coffee mugs. A lot. Today I'm celebrating National Coffee Day with my new favorite Personal Creations coffee mug! 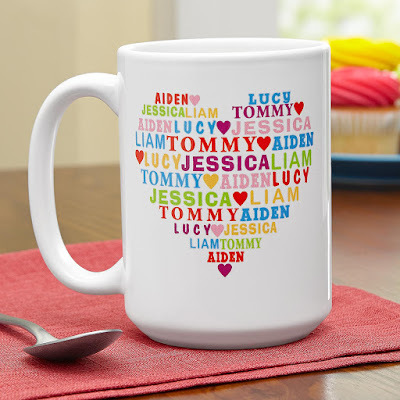 This one has a heart filled with all of the names of my children and my grandbaby in a colorful and very cute heart that covers the front and back of the mug. The mug (ever so appropriately) is called The Heart Full of Love Mug! It is a generous 15 oz. and allows you to put up to 12 names (of people, things you love, places you've traveled...or want to travel to) up to nine letters a piece. There are other mugs that are cute too (lots and lots of them!). This Half Heart Square Set is great for couples! I've never seen a set like this one, but I really like it. These are hearty 8 oz. square mugs that when placed side-by-side create a full heart. 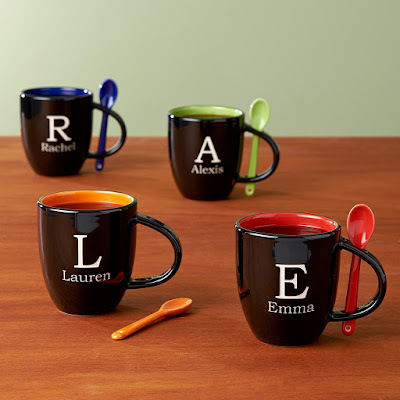 An Initial Mug with a spoon that is personalized makes a great gift for anyone, don't you think? I'm loving these for National Coffee Day, and I'm also thinking these would be great gift ideas for the upcoming holidays. Tuck a little bag or box of coffee in a pretty gift big alongside this mug and let someone know you are happy to call them friend! This mug holds 12 oz. and the spoon color coordinates to the mug lining. This 15 oz. 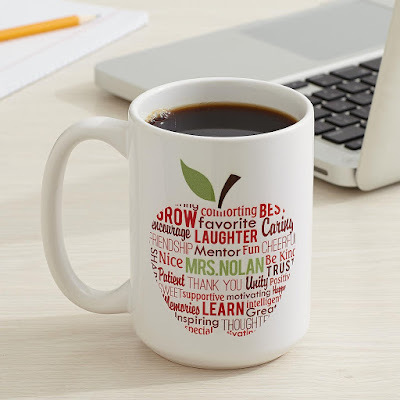 Apple for Teacher Mug is a great way to brighten a day!! Whether it's for National Coffee Day or Christmas (we're getting one for the latter), this is a great way to say, "I appreciate all that you do! to your favorite teacher, every single day! Personalize with any name up to 18 characters. The inspirational words are filled in for you. All of these mugs are dishwasher and microwave safe. All are perfect to help celebrate National Coffee Day too!! So happy NCD to you, and happy NCD to me too!! And a big thank you to Personal Creations for helping us celebrate the fun day in an awesome way. You can learn more about them and all of the items they so uniquely personalize (they have over 10,000 items for sale!) by visiting their website. You can also follow them on Facebook and/or Twitter. I don't have any cute mugs, so I need to get on that. I always see people instagramming their cute mugs and I want to do that, too! I love my coffee too and I'm having my morning coffee right now. I love those mugs with the spoons. I need to get some for company. These are awesome cups. I wish I liked coffee. I can't live without coffee! It is my guilty pleasure and I love it!! Btw, those mugs are so cute! The heat mugs are really cute. Aww they are so cute. Happy National Coffee Day! While I've never been a coffee drinker, I LOVE a glass of hot chocolate and these mugs are soo cute. I always have a couple cups of coffee in the morning and I love to have cute mugs to drink it out of! 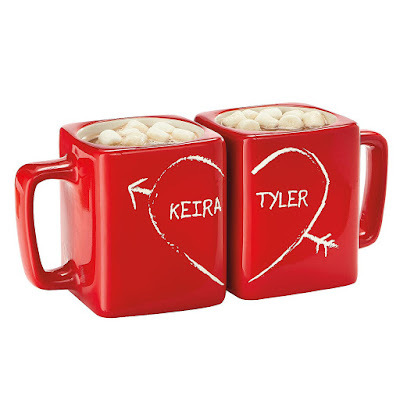 These mugs are too adorable, they're the perfect gift for your loved ones. I like the ones with the names and the inspiring words, it's really cute and sweet. I don't drink coffee, but I still love a good personalized mug. I have one I received last year that I use all the time. Each time I see it or drink from it, it warms my heart. As a teacher I received so many mugs but nothing ever personalized like this. It's a great idea. So many fun cups! I am addicted to coffee! Now, I only do iced coffee, but I have an obsession with big coffee mugs to drink my hot tea out of in the mornings. I really adore the first one where you can put your favorites right on the mug. What a way to feel super happy each morning you wake up and look at it! How did I miss that it is national coffee day!!! I love these mugs they are super cute! Those are some very nice designs. Oh, nice and cute designs. This is a lovely idea for the teacher's month on my son's school. I like personalized mugs too. Happy national coffee day and we deserved a good cup of coffee! Oh, these are cute mugs! I love the last one, perfect for my coffee time! Ooh I love these mugs! So very cute. I love mugs. All my friends are amazed on how much mig I have. I enjoyed mugs that have messages on them or ones with unique design. I am one of those crazy lover of coffee and I love them in any form anytime. A National Coffee Day sounds amazing and I am in love with those beautiful personalized mugs as well. These are really cute designs!!! I really love the first one. What great cups! looks like there is something for everyone! That's a lot of names that fill your heart. :) I love that mug Rosey! 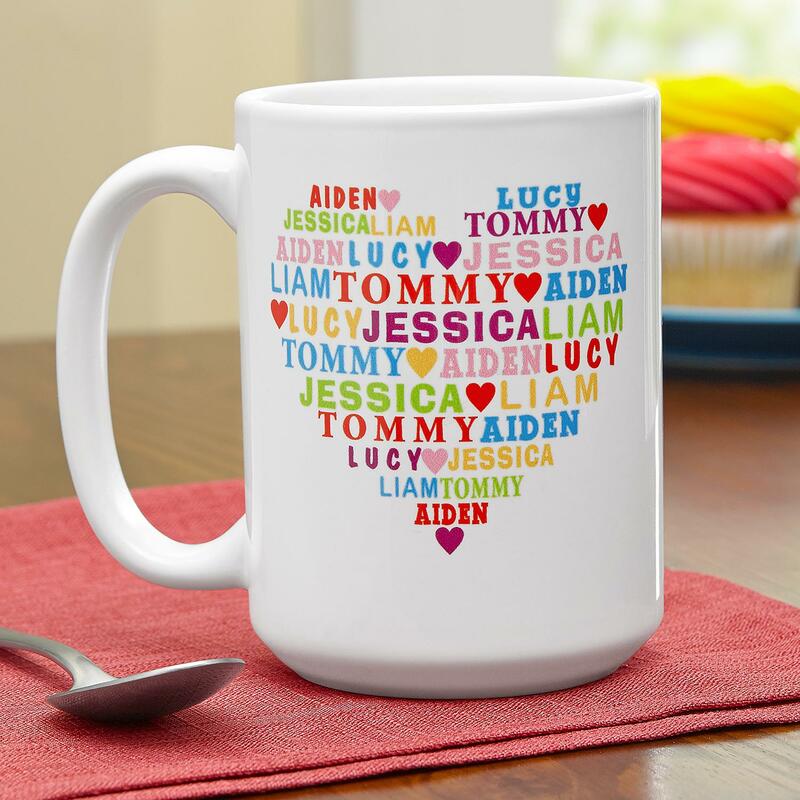 My kids LOVE personalized coffee mugs. The ones with the attached little spoons would be so perfect. Such a cute set of mugs! I love these all! You can really never have too many - unless your cabinets overflow with mugs like mine does haha!! National Coffee day? I was unaware of this day may be because I am living in the other part of the world. If I am not wrong everyday is dedicated to someday; I wish to have an empty day as well LOL. By the way, I love these mugs. Personalized cups make for some pretty awesome gifts! I like the Apple for Teacher Mug a lot! Should get a few and give them out each year to my son's teachers. These are so darn cute! I'd love a mug like this! How did I not know it's National Coffee Day??? Cute mugs! I love the initial coffee mugs! Those would be perfect gifts for the family for Christmas and sipping hot chocolate.